This easy to read mini-book, “Me, Too!”, will get your crew comparing their own basic needs with those of birds! 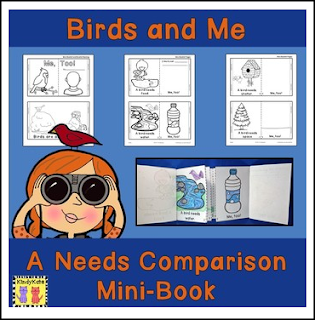 It’s a sample from my Birds: Songs & Rhymes resource, with 26 songs and rhymes (and accompanying activities) reinforcing the basic needs of birds, bird adaptions (beaks and feet), nest building, eggs, and the life cycle of birds. and Homeschool. I hope you and your students enjoy it! For more ideas. follow me on Pinterest! Be sure to click on the green star to follow me!